Dramatic Irony (n.) def: insight or information understood by the audience of a play but not grasped by one or all of the characters within that play. Dramatic Irony occurs when a character lacks integral information and as a result makes a bad or humorous or, at times, serendipitously excellent decision. For example, in Romeo and Juliet…hang on. Okay, I’m gonna give the ending away, folks. So if you haven’t had the time in the last 400 years to update yourself on the outcome of Shakespeare’s most well-known romantic tragedy, I’m about to spoil it for you because you should have spent less time messing around with your Aqua-Doodle or Mario Brothers video games and more time reading. (Spoiler alert/scolding over—let us resume, shall we?) In Romeo and Juliet, Romeo hears that his new wife and love of his life Juliet has died. He rushes to Juliet’s side to kill himself next to her so he can at least share in her death since he can’t share in her life—excellent decision-making skills at work here already. He and his poisonous dram hover over her. Tearfully he declares how fair she looks—she just doesn’t look dead! Then he drinks his poison. His corpse falls by Juliet’s body just moments before—gasp!—Juliet wakes up. The audience has known that Juliet was faking her death in order to be with Romeo because we were privy to a previous convo between our heroine and good ol’ Friar Lawrence as they plotted her pseudo-demise. Yet Romeo lacked that pertinent (to say the least) information and so made an ill-informed—and in this case, fatal—decision. My friend snorted and we passed by her, only to hear a voice behind us say, “Oh, you’re Americans too?” Yes, that woman was American and understood perfectly my untimely insult. Had I but known she was American and could understand me, I would have kept my mouth shut and nursed my scorched eyes back to health in silence. Yet only afterward was I privy to some pertinent information. Thus another notch was added to my belt of Putting-My-Foot-In-It. We, sadly, are not granted the luxury of knowing the specific outcome of our decisions. (Although we should by now be able to determine natural consequences—i.e. step in front of a bus = flattened by said bus.) Nor are we able to know all the time the full body of information needed to make fully informed decisions. This limitation at times leaves us with regret, at times with thankfulness, and at times with a stinkin’ hilarious story to tell at parties or at family gatherings or on our blogs where we already know there is little-to-no self-dignity left to preserve anyway, so why not entertain the masses with our humiliation. Therefore, I am taking a page from Kate’s blog play book over at Nested, and starting a series. I invented a theme. I created a meme. (That rhymes!) 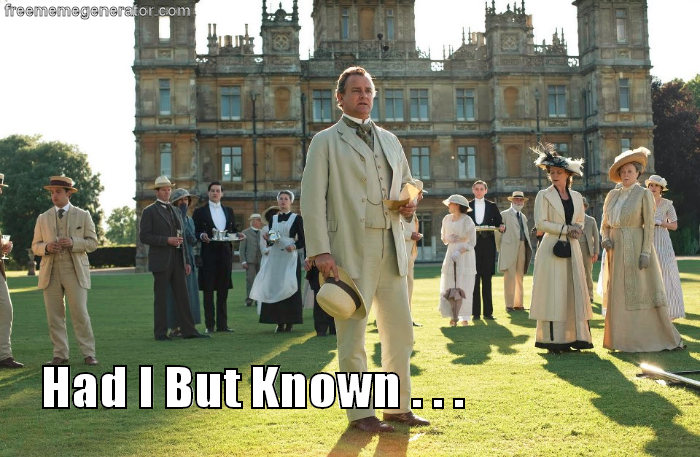 A Downton Abbey meme, of course. Because it’s my blog and because I cannot get enough of these loveable Brits. And occasionally I’ll be sharing a personal encounter with dramatic irony, or I’ll be asking others of my acquaintance (real, cyber, or otherwise) to share their own dramatically ironic experiences. Because, let’s face it, we’ve all had them. And either we can get a good laugh or we can learn from it. (Except for Romeo because he pretty much limited his opportunity to learn when he killed himself.) And the best part is that we get to do our living, laughing, and learning together! Yay! I love blog series!!!! And this one sounds fantastic! I think we all know I'm a sucker for anything with a good meme. This sounds like a really neat idea, Anna! Thanks, Wendy! So fun to see you here!